Ginny Smith has been a medical assistant for more than half of her 39 years at Mt. Auburn OBGYN. Going from the front desk to the billing department and finally to her current position, Ginny has always loved the deeply personal relationships that our practice has with patients. Get to know her! As medical assistant, Ginny is an open ear, there to listen to patients and reassure them when needed, while recording important information for the doctors. She recognizes that everyone she calls out of the waiting room has a different story and a unique set of needs. This means that her goal is to touch each patient in a different way that leaves a meaningful impact. She believes that this care for the individual expands beyond just her position. Ginny emphasizes the family-like atmosphere at Mt. Auburn, where the doctors are kind and caring. She appreciates how the staff treats each other, thanking one another for their contributions and taking time to inquire about personal matters, like how the weekend went or how the kids are doing. In her work with us, Ginny has learned greater patience and improved her listening skills. She avoids judgment of others and wants to be the kind smile that comforts patients. Ginny asserts that she wouldn’t be the person she is today without her experience with patients. 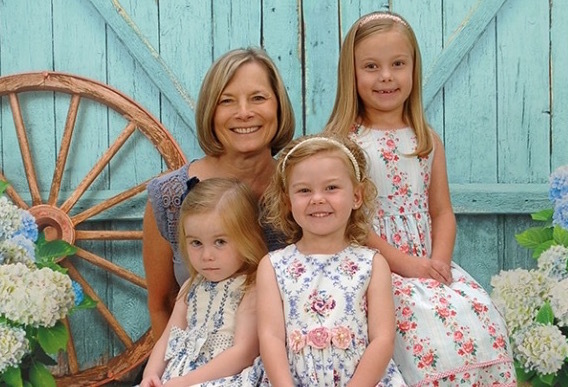 In her eyes, it has helped her to be a good grandparent for three beautiful granddaughters. Ginny has been married for 42 years and counting to her high school sweetheart, and during this time she’s given birth to both of her boys at Mt. Auburn. Her daughter-in-law also had three girls, the previously mentioned granddaughters, delivered by our practice. We are so proud to call Ginny a member of the Mt. Auburn family, and to have welcomed her children and grandchildren to the world. She is part of our longstanding tradition that has provided individually focused care for generations. Learn more about who we are at mtauburnobgyn.com/our-practice.